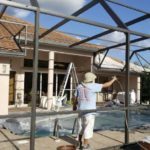 Screen Replacement & Repair / Rescreening Lania's and More..
A screened in pool cage is one of the best accessories a Florida homeowner can have. Like other areas of the home they need to be maintained and occasionally repaired or painted. 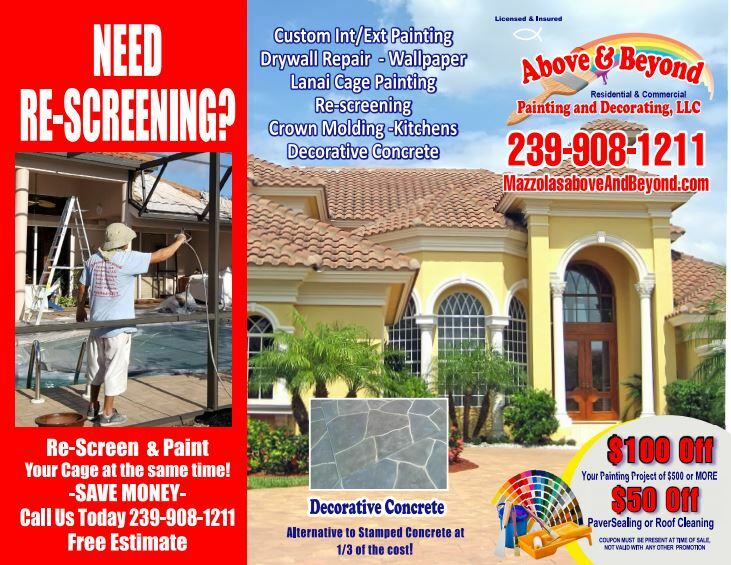 Above and Beyond Painting can not only repaint the lanai, we also offer re-screening or screen repair. We can carefully refinish your pool cage, repaint it, add new screen and have it looking new again. Enclose your pool without blocking out the fresh air with a screen enclosure. Our professionals will come out and take all required measurements to pre-fabricate a new screen enclosure for your home or business. Tight, durable screen, perfect protection from small insects used in Patio screen repair, porch screen replacement, pool rescreening, windows screen installation. There are many benefits to having a pool enclosure in Florida. You can enjoy being able to use your pool year-round and will be protected from debris. Debris can be a real pain to remove from your pool. It can take an hour or more to scoop leaves, dirt, and other things that may have blown into your pool. If your pool were enclosed, you would spend much less time cleaning debris. You will also use less chemicals since your pool will remain cleaner and clearer for longer periods of time. Less debris means less chemicals in your pool. Another advantage of having an enclosed pool is an added layer of security to your home. Most enclosures include a lockable gate or door. This will help to keep intruders, as well as unwanted wildlife from entering onto your property. If privacy is an issue, pool enclosures would be ideal. With a pool enclosure, you won’t have to worry about unwelcomed viewers. You’ll be able to have confidence and peace of mind that you are swimming without unwanted onlookers. 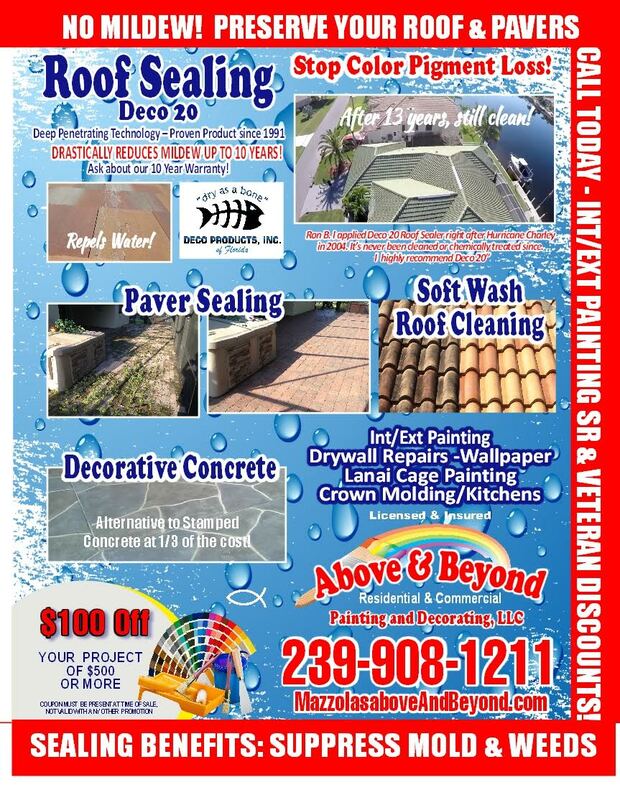 Let us repair your existing Patio or Pool Enclosure. From a screen panel to a complete re-screen, structure repair, new fasteners, new super gutter or a new door, we can do it all. Once our experts arrive to your property, they’ll assess whether your enclosure can be repaired or if a complete re-screen makes more sense. If your screen can be repaired, that is always our first option. We have rehabbed pool enclosures and Lanais throughout Collier and Lee County’s. 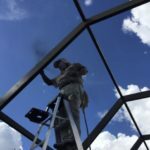 When building a screen enclosure, we use heavier aluminum beams, increased wind and roof bracing, and longer lag screws to attach the enclosure to the concrete deck. These efforts are good for the strength and appearance of your enclosure. Our pool enclosure company uses stainless steel fasteners to anchor the enclosure to the concrete deck; we insure the chlorine gasses from pool will not rust away the metal holding your screen enclosure together. We use high grade aluminum to make your wind bracing and k-wall bracing. It looks and performs better and adds strength at no additional cost to you. One of the easiest ways to rejuvenate your home is by adding a sunroom. Adding a new sunroom to your home will enable you to enjoy a beautiful view of the outside space around your home from the comfort of indoors. Some of the biggest advantages of a sunroom is that it will make the most of the outdoors while eliminating annoyances such as bugs, direct sunlight, and inclement weather. Once you get a sun room created, you’ll find yourself spending more time there than any other room in your home. You could make it your personal paradise, your family’s retreat, a place to relax, exercise, entertain, or reduce stress while enjoying the natural environment surrounding you. Our sunrooms can be built as a free-standing structure for a poolside cabana or an entertainment room separate from your home. Adding a new sunroom to your home will enable you to enjoy a beautiful view of the outside space around your home from the comfort of indoors. Sunrooms are lit by the sun’s natural light and are built using many windows. This creates a nice escape from artificial lighting. When properly maintained, Lanai’s eliminate some of the biggest nuisances associated with outdoor activity. However, when old or damaged screening no longer provides the protection you need from flying or crawling pest, you can replace it yourself or call Above and Beyond for a free quote!